I could go on about how busy life has been for me in the last few weeks, but hey, we ALL lead busy lives and busy-ness is overrated! 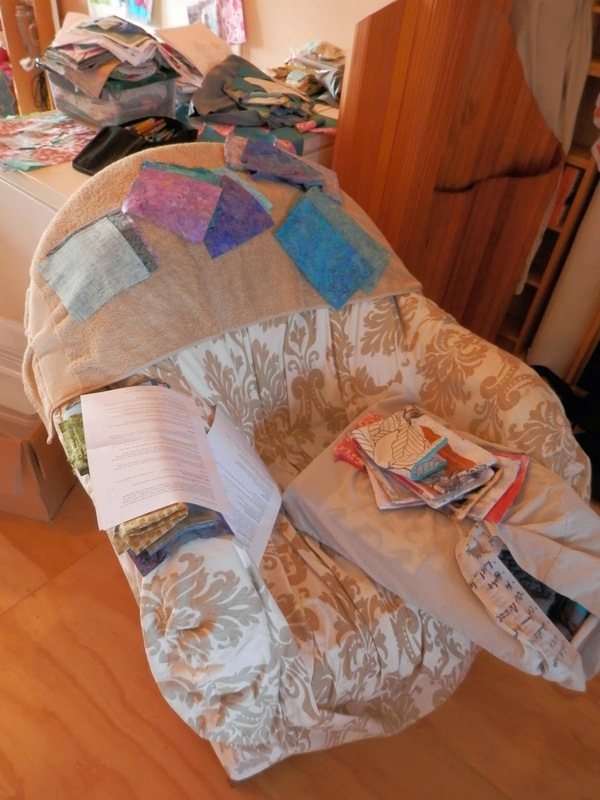 So instead, I thought I'd write about how I've been trying to squeeze in my quilting and art in little bits and pieces around the big chunks of 'life'. I miss quilting and creating when I don't make time for it - I get a little grumpy - so I've had to think up ways to be creative in small bites. And these small bites make a big difference to my mood. Handwork, in this case, embroidery on hand-dyed batting squares. I can pick up my little embroidery kit and take a fair few stitches in 10 minutes. 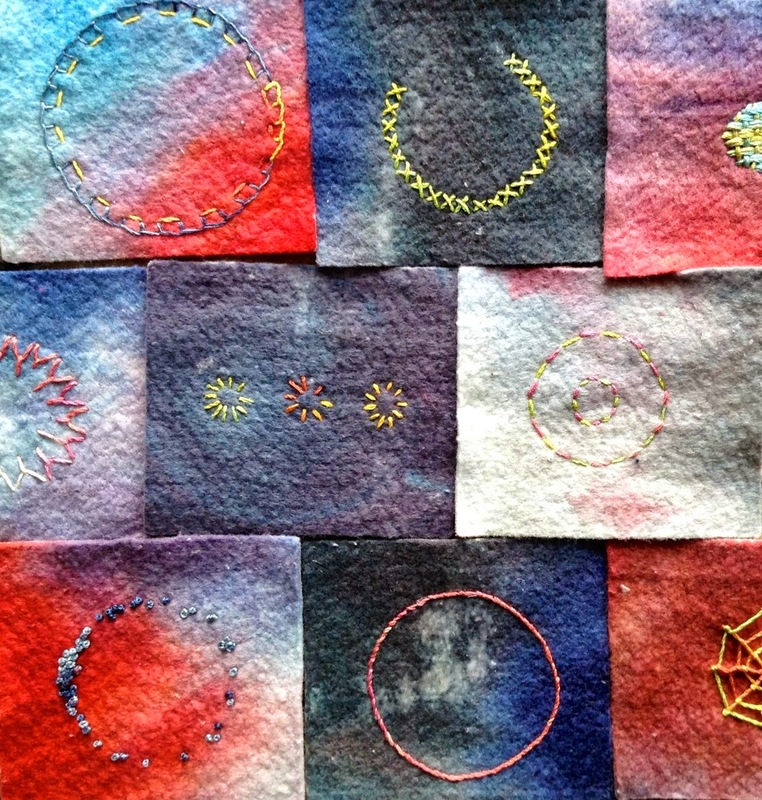 I set myself a theme of circles so I don't have to think about what to stitch, I can just start. Working in my sketchbook. Particularly sketching on pages that are already prepared. Or I can put together a collage of leftover practice mono prints on paper. Me and my gluestick can make a beautiful composition in about five minutes flat! Looking around at the world. 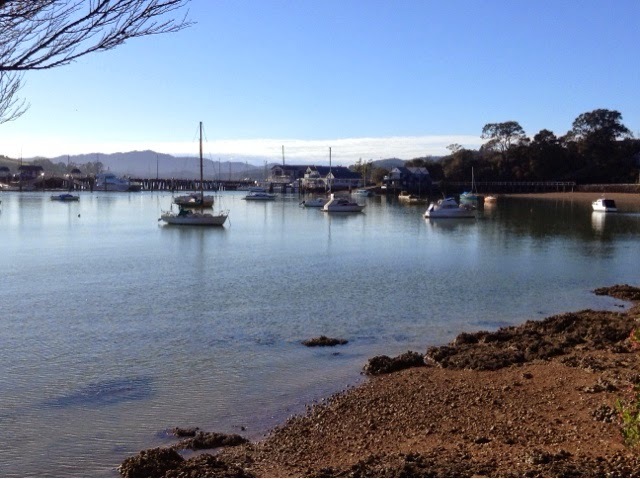 I can feel frustrated or I can let my imagination run wild while I'm busy painting white walls in my boat. I can look at the ship's wheel and imagine how it would look on a quilt, superimposed over an image of the porthole. And I can take photos of inspiring objects - whether it be for shape, pattern or colour - in about 30 seconds. When I have a little more time, say 15 minutes, I can doodle free-motion quilting designs. I often draw out the block I want to design a motif for and then I can draw over it in pencil until I find the right one. I could do this on the computer too in a photo or drawing program, but pencil and paper are quicker and more portable round the house. Then if I leave my quilt spread out under the sewing machine, I can sit down and quilt one block in about 10 minutes. And those 10 minutes add up - all 28 of my 16 patches on my big blue and white quilt are now quilted. It's time to move onto the 18 bordered square blocks. How do you fit creativity into your life? I've been invited by Elizabeth, over at The Silverscrapper's Craft Space, to be part of the Creative Blog Hop. This is an on-going Monday event designed to introduce readers to other creative bloggers and I thought I'd join in for something a little different. I'm supposed to answer a few questions about myself and then introduce you to three other creative bloggers. Next Monday it will be their turn. 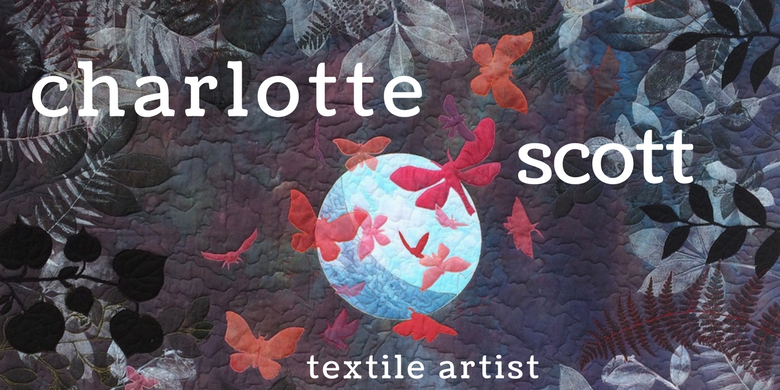 My name is Charlotte and I'm a quilter. For other quilters that probably says it all: I'm addicted to fabric, colour and texture; I love thread in all its glorious weights and I have far too many projects on the go. I make quilts that double as art pieces, they hang on the wall and beg to be touched and I make more traditional quilts that go on the bed or couch and are perfect for snuggling. I design, make, write and teach and it's my dream to do it all for a living one day! Somewhere in amongst the fabric is my family. 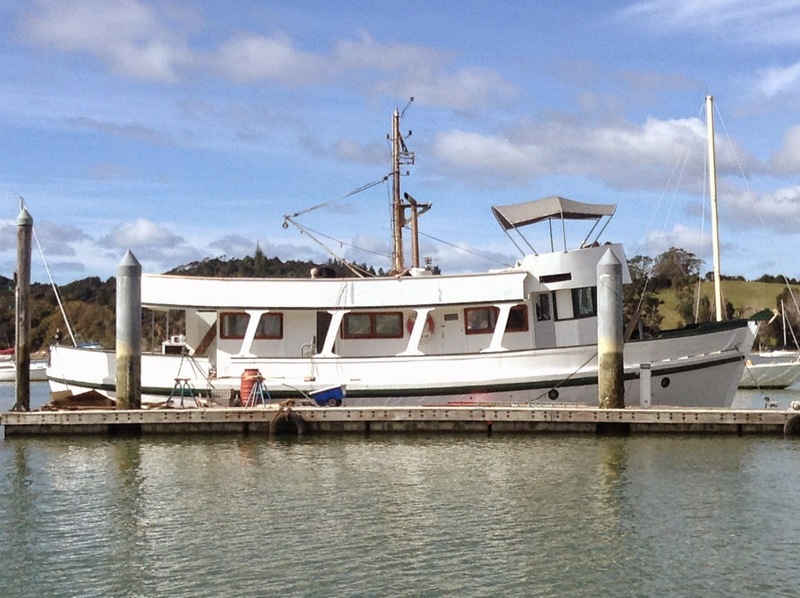 We live in rural New Zealand and our current exciting project is the renovation of an old Navy minesweeper boat - shortly it will become our home! Um, far too much! I have a habit of dreaming big when it comes to entering quilts in exhibitions and as the due dates come closer and closer I have to narrow it down. Currently I'm working on a large painting project.....my boat. It's seriously cutting into my quilting time so I've had to knock a few quilt ideas on the head. To keep my hand in, I'm nibbling away at machine quilting a humungous blue and white quilt that I started about seven years ago. 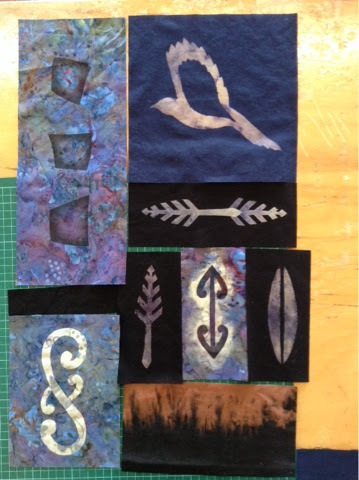 I'm also trying to keep one step ahead of my students in my Beginner's Quiltmaking Class with the samples I need to make to show them techniques. Quiltmaking is such a huge genre. 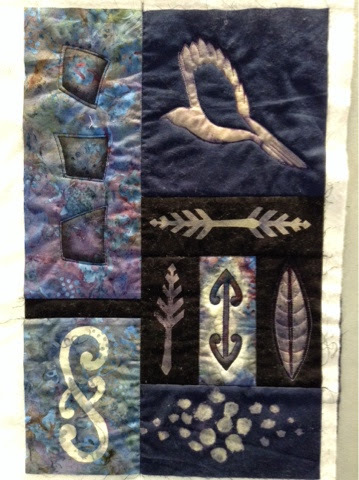 Traditional, modern, hand pieced, appliqué, free-motion quilting, thread art - it can encompass it all. 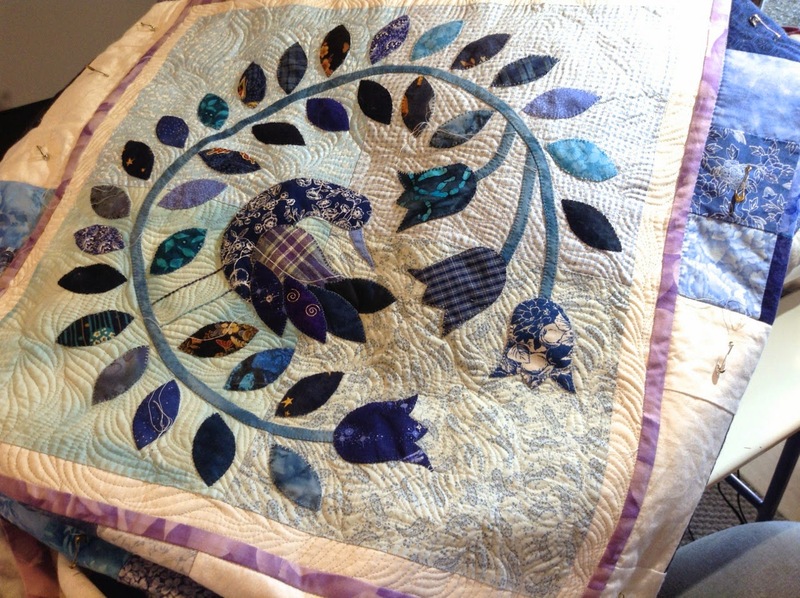 I describe my style as eclectic, I make traditional quilts as well as art pieces. I prefer machine piecing over hand piecing, but I do dabble in a little english paper piecing. 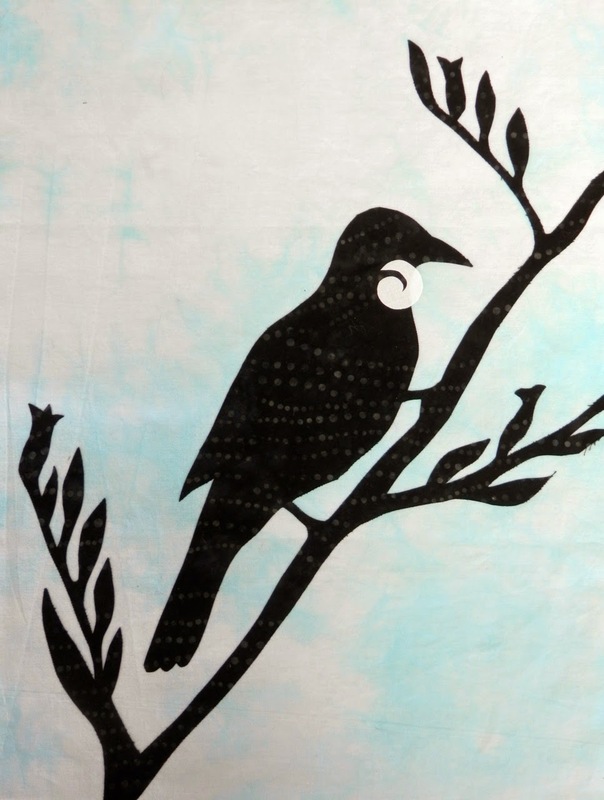 I love to hand dye fabrics, and my quilts often feature these. I love appliqué, I use silk organza, I've included work in coloured pencil on fabric. You'll often find birds in my work - New Zealand is a real avian dominated eco system, and I think that has something to do with it. I love the process of making, the discovery in each quilt I do. There is something new in every work, that I couldn't have discovered if I had just thought about it, I have to do the work to find it. The satisfaction of looking at a completed quilt and knowing that I made it is also a strong motivator, and when I give quilts away as gifts and see how much people enjoy them, it's so heartwarming. I once called in to an acquaintance for a visit, and saw their toddler snuggling on the couch with a very well worn quilt I hadn't given him as a baby. Best feeling ever! I don't have a set formula. Sometimes my inspiration is an image, sometimes a theme for an exhibition really catches my imagination, sometimes an emotion or idea just pops into my head (often in the middle of the night, or when I'm in the shower). 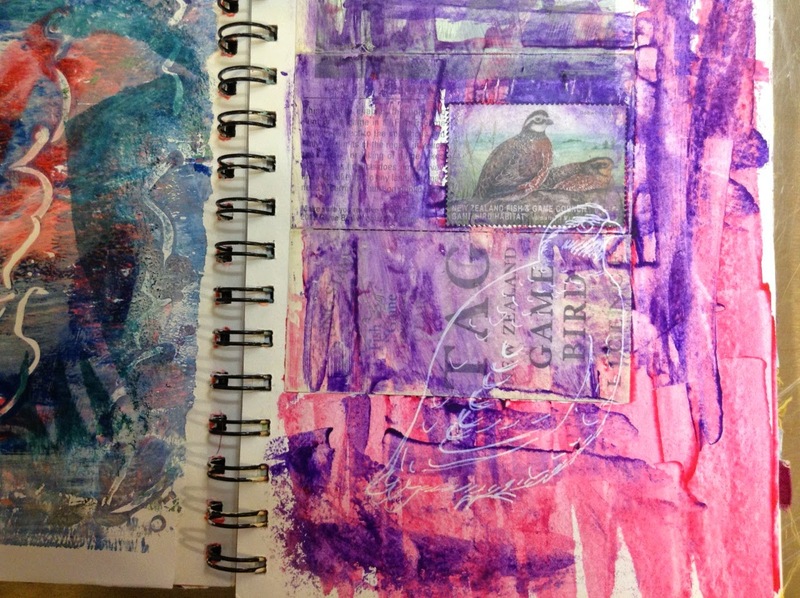 I use a sketchbook for ideas and processes too. This really helps keep my ideas in one place. As I have way more ideas than I'd ever have time to turn into quilts, I need a way to keep them organised, and it's useful to refer back and get inspired all over again. 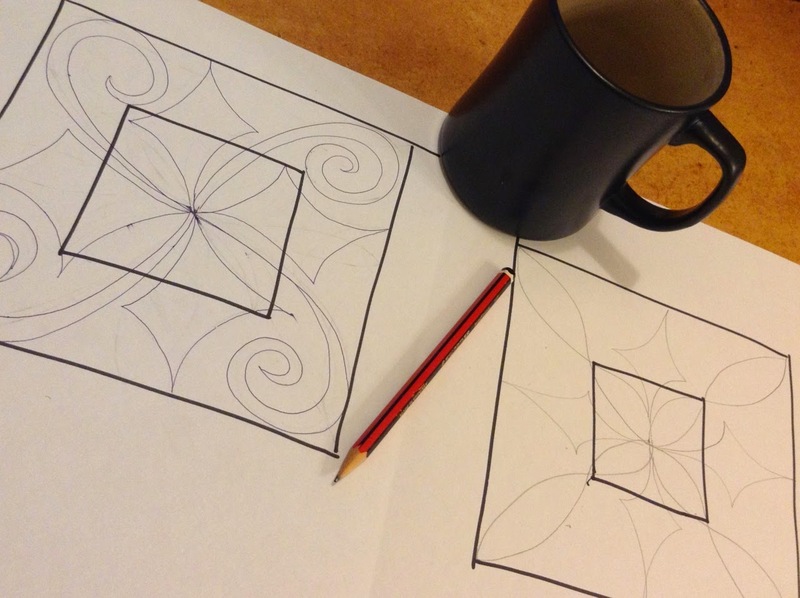 I often use a gridded exercise book to work out patterns and proportions too. My next favourite tool is a big roll of packing paper. For an art quilt I can usually tear off as much as I need and draw up a design full size. This is really helpful to see if it works. I like to play with fabric combinations and these might change quite late in the process of the making the quilt. 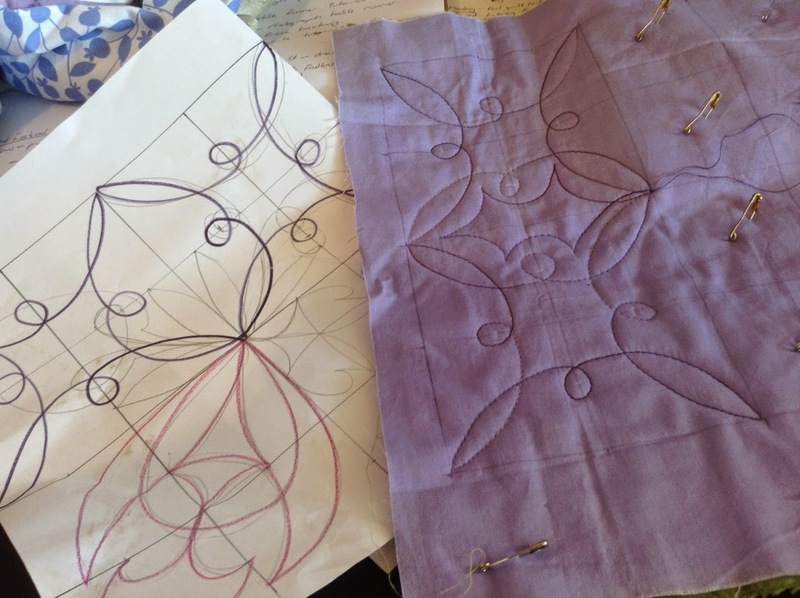 Lastly, I find it really helpful to make quilting design decisions on a quilt. So I make practice quilt sandwiches and quilt out any ideas on there first to check what they look like. My minds eye is not always accurate! Now, it's Monday afternoon, I've been writing this in bits and squeaks during the last few days, I'm supposed to post this today, and I've spent the last week painting that #%£*&;% boat and not making any time to find creative bloggers willing to take up the next round! My bad. This is the one that starts, "This is your life, do what you love and do it often." If you don't know it, go read it. If you haven't read it in a while, go read it again. Pat Sloan's blog post: http://blog.patsloan.com/2009/01/the-business-of-quilting.html about the business of quilting. She writes about the questions people ask her about turning their quilting hobby into a business. It's particular to quilting, but it does have recommendations that are pertinent to any creative pursuit. I also invite you to check out the blogs on my sidebar - lovely blogs from creative people, and if you are interested in writing about your creative process, leave me a comment asking to join in the blog hop and I'll add your blog link and blurb to this post (sorry Elizabeth, I feel stink that I've broken the chain, but life interruptis). My daughter read this book to me today, "Mrs. Squirrel and Hazel." 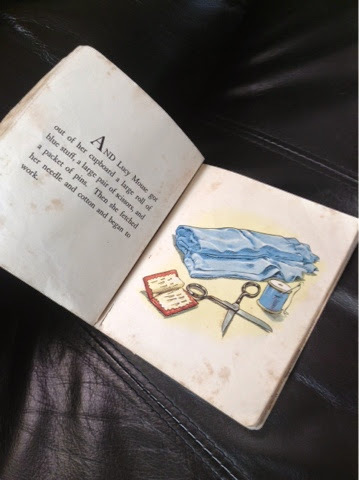 It was my mother in laws favourite childhood book. Isn't it sweet? I'm just popping in to say hello. We are busy, pushing hard to get the last of the painting on the boat finished so we can start moving on board. It's taking lots of time, so not much quilting, or blogging, is being done. We've moved Cerego to her new berth. You can see her here, very far in the distance, beside the buildings in the middle of the picture. Ok, I can see her because I know what I'm looking for, but you might not - I assure you she is there! So this weekend will bring more painting, hopefully the last of it. I hope you have a productive weekend whatever you're up to. How to tell when it's time to do housework. 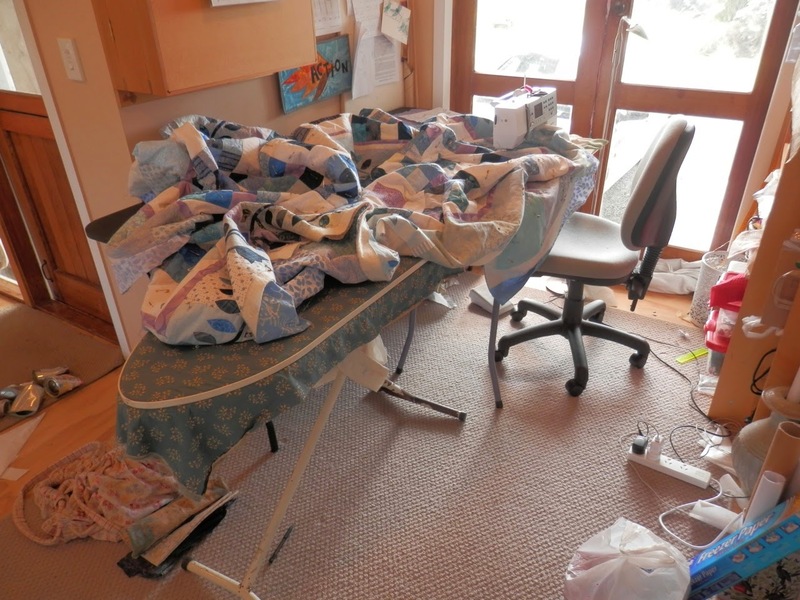 I cleaned off my trestle table and my ironing board so I could use them to surround my Sew-ezi table. I decided to spend some time quilting my big blue and white quilt and I need to support the mammoth weight of the quilt while I'm working on it. I put all the bits and pieces that were on my ironing board and trestle table onto my chest freezer, which doubles as my cutting table. But now I want to make some soup and I need to get into that freezer. Where can I put that junk highly important bits and pieces? On the laundry bench? 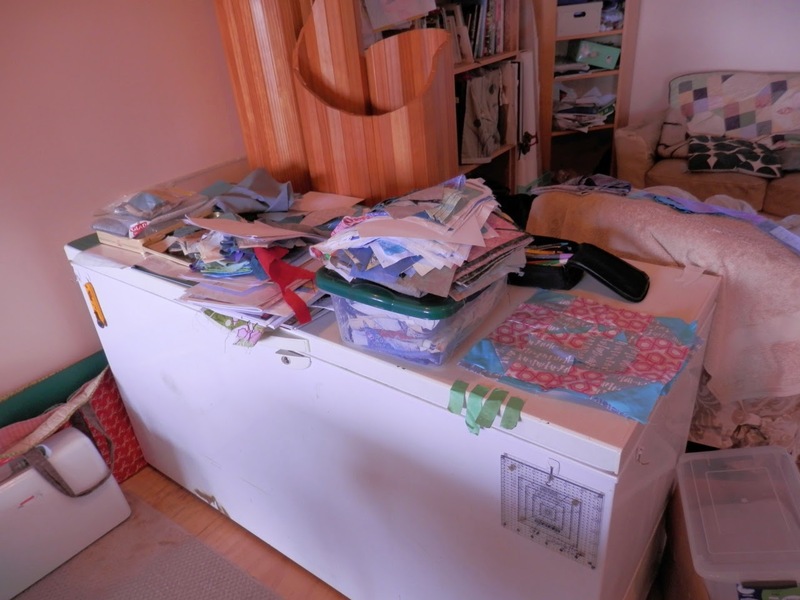 Nope, that's my ironing space (see previously mentioned repurposed ironing board), a repository for washing-needing-to-be-folded and storage for art stuff that hasn't made it back to the cupboards. I know, I'll put it on the studio chair aka cat bed. Oh shoot, that's being used to store quilts, zip pouches, patterns I'm writing and fabrics I'm auditioning. Maybe I don't want to make soup. But there are kids to be fed. 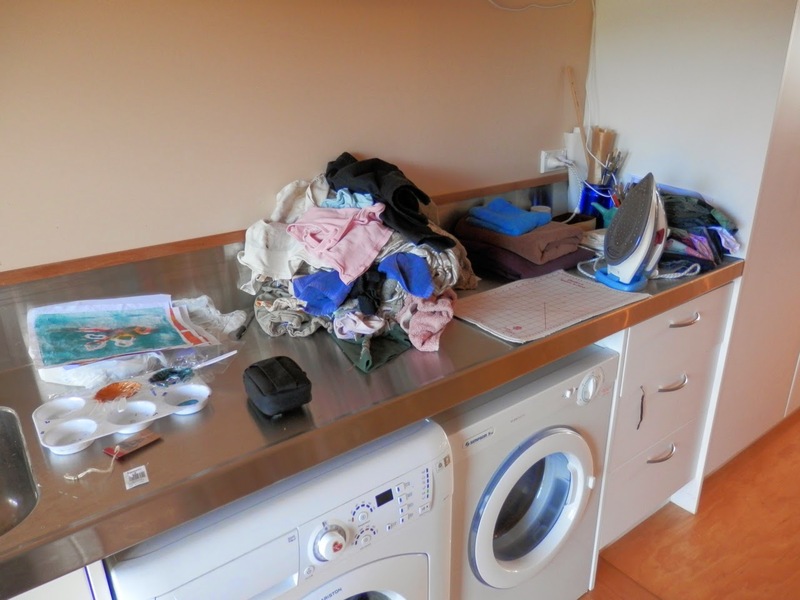 It's time to do some housework, isn't it? Today I had a morning cup of tea with my good friend, Mathea, who generously didn't bat an eyelid when I whipped out my voice recorder and grilled her about her life and her art quilts. 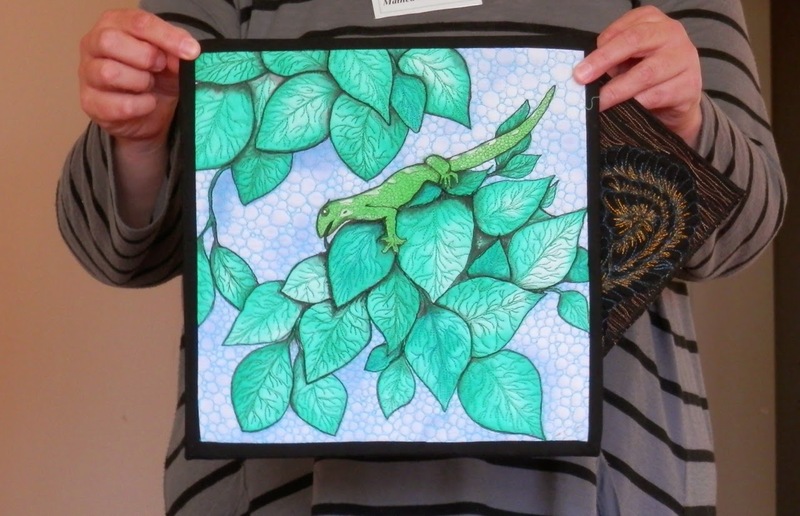 Here's a couple of photos of Mathea's work that I happened to have from a show and tell session at our quilting club. 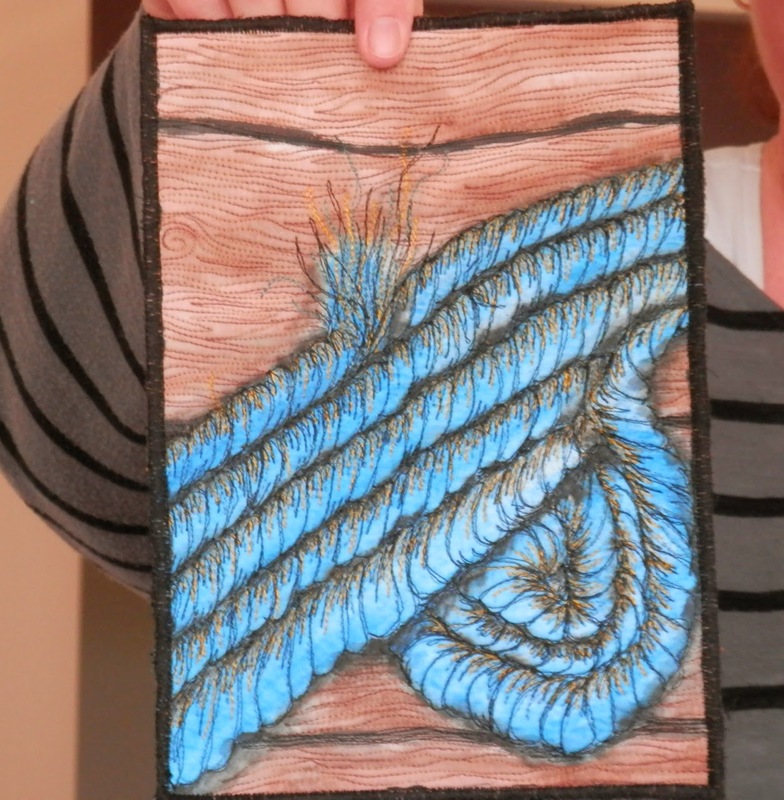 Mathea's website is Esparta Fiber Arts, and you can find her blog and her work there. 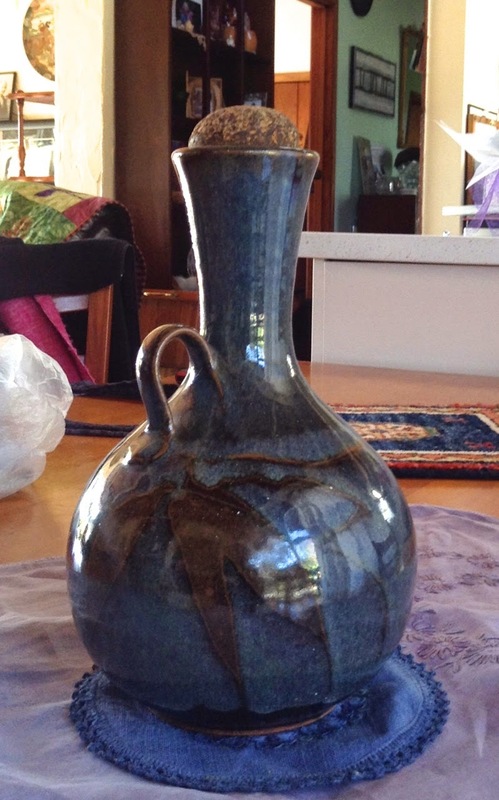 We also mentioned the New Zealand artist Ralph Hotere. This weekend I'm retreating. I'm at a quilt retreat that has a two day class involved. And it's right up my alley, with discharge using decolourant paste, using stencils and a bit of paint. Our tutor is Jaqui Karl and she's doing a great job of encouraging us to try new things. Above is my bits and pieces while I tried out different arrangements. And below is quilting in progress. Apologies for hideous photos and a weird blog post but I'm using the Blogger ap. have to make do when you're out and about. Now I'm off to have a glass of wine and some dinner. Have a great weekend!